A combined authority is a type of local government institution introduced in England outside Greater London by the Local Democracy, Economic Development and Construction Act 2009. There are currently six such authorities, with the Greater Manchester Combined Authority established on 1 April 2011, four others established in April 2014, and a sixth in April 2016. Combined authorities are created in areas where they are considered likely to improve transport, economic development and regeneration. Combined authorities are created voluntarily and allow a group of local authorities to pool appropriate responsibility and receive certain delegated functions from central government in order to deliver transport and economic policy more effectively over a wider area. Following the abolition of metropolitan county councils, and the Greater London Council, in 1986, England had no local government bodies with strategic authority over the major urban areas of the country. In 1999, following a successful referendum, the Labour government created a strategic authority for London (the Greater London Authority), but no bodies were established to replace the metropolitan county councils outside London. The Blair government instead pursued the idea of elected Regional Assemblies, although following an unsuccessful referendum in the most positive region of the North East, this idea now has few proponents. The idea of city regions was proposed subsequently. In October 2010 the Coalition Government introduced measures to replace Regional Development Agencies, which were described as inefficient and costly. They were replaced with Local Enterprise Partnerships, voluntary groups with membership drawn from the private sector with local authority input. In 2010 the Government accepted a proposal from the Association of Greater Manchester Authorities to establish a Greater Manchester Combined Authority as an indirectly elected, top tier, strategic authority for Greater Manchester. Following the unsuccessful English mayoral referendums in 2012 combined authorities have been used as an alternative means to receive additional powers and funding as part of 'city deals' to metropolitan areas. 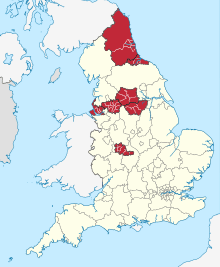 In 2014 indirectly elected combined authorities were established for the metropolitan counties of South Yorkshire and West Yorkshire, and two combined authorities were established which each covered a metropolitan county and adjacent non-metropolitan districts: the Liverpool City Region Combined Authority for Merseyside and the Borough of Halton unitary authority, and the North East Combined Authority for Tyne and Wear and the unitary authorities of County Durham and Northumberland. A number of further combined authorities are proposed. The combined authority is a legally recognised entity able to assume the role of an integrated transport authority and economic prosperity board. This gives the combined authority the power to exercise any function of its constituent councils that relates to economic development and regeneration, and any of the functions that are available to integrated transport authorities. For transport purposes combined authorities are able to borrow money and can levy constituent authorities. Combined authorities are encouraged to borrow from European institutions for social and environmental schemes which meet EU objectives. Loans are made with conditions attached which further EU policies. By 2015 Greater Manchester CA had agreed loans from the European Investment Bank which topped £1 billion with similar liabilities to the Treasury and private business. The Local Democracy, Economic Development and Construction Act 2009 allowed for certain functions over transport to be delegated from central government. The Localism Act 2011 allowed additional transfers of powers from the Secretary of State for Communities and Local Government and gave combined authorities a general power of competence. The powers and functions to be shared are agreed by the metropolitan district, non-metropolitan district, non-metropolitan county or unitary authority councils. Combined authorities consist of two or more contiguous English local government areas. The creation of a combined authority is voluntary and all local authorities within the area must give their consent before it can be created. The local authority of any district of England outside Greater London can join a combined authority and a county council can become part of a combined authority even if only some of the non-metropolitan districts that make up the county are within the combined authority area. A local authority may only belong to one combined authority. "...the exercise of statutory functions relating to transport in the area, the effectiveness and efficiency of transport in the area, the exercise of statutory functions relating to economic development and regeneration in the area, and economic conditions in the area." On completion of the review the local authorities produce and publish a proposed scheme of the combined authority to be created, including the area that will be covered, the constitution and functions. This will include details of membership of the authority, remuneration, and how meetings will be chaired and recorded. Following a period of consultation and subject to the approval of the Secretary of State for Communities and Local Government, the combined authority is formally created, dissolved or altered by a statutory instrument. Map of the existing and approved combined authorities. The combined authorities that have been created or are planned to be established are as follows. Following the unsuccessful English mayoral referendums in 2012, new combined authorities were encouraged as an alternative structure to receive additional powers and funding as part of 'city deals'. Agreed to bid for a combined authority but do not have agreement of the district councils. In 2014 the government consulted on changes to the legislation governing combined authorities. Proposed changes included extending the legislation to Greater London, Wales and Scotland. The Cities and Local Government Devolution Act 2016 received Royal Assent on 28 January 2016. The act allows for the introduction of directly-elected mayors to combined authorities in England and Wales with powers over housing, transport, planning and policing. ↑ "Local Enterprise Partnerships white paper" (PDF). ↑ "John Denham - Greater Manchester to be country's first ever Combined Authority". The National Archives. The Department of Communities and Local Government. 31 March 2010. Retrieved 15 November 2015. Historic plans for the country's first ever Combined Authority covering the whole of Greater Manchester to drive locally the region's economic growth were launched by Communities Secretary John Denham today. ↑ "A plain English guide to the Localism Act" (PDF). Department for Communities and Local Government. November 2011. Retrieved 15 December 2015. ↑ "Combined Authorities" (PDF). House of Commons Library. 9 October 2015. Retrieved 15 December 2015. ↑ "Economic prosperity boards and combined authorities: Consultation on draft statutory guidance" (PDF). Retrieved 11 August 2012. ↑ "Combined Authorities Briefing: Stronger Together?". 5 July 2012. Retrieved 11 August 2012. ↑ "Local Democracy, Economic Development and Construction Act 2009". Retrieved 11 August 2012. ↑ "Cities' economic power unlocked in radical power shift". 5 July 2012. Retrieved 11 August 2012. ↑ Sergeant, Mike. "Six biggest English cities get extra powers - BBC News". Bbc.co.uk. Retrieved 2015-09-07. ↑ "The Greater Manchester Combined Authority Order 2011". Retrieved 11 August 2012. ↑ "The Halton, Knowsley, Liverpool, St Helens, Sefton and Wirral Combined Authority Order 2014". ↑ "The Durham, Gateshead, Newcastle Upon Tyne, North Tyneside, Northumberland, South Tyneside and Sunderland Combined Authority Order 2014" (PDF). ↑ "The Barnsley, Doncaster, Rotherham and Sheffield Combined Authority Order 2014". ↑ "The West Yorkshire Combined Authority Order 2014". ↑ "Oxfordshire, Buckinghamshire and Northamptonshire councils unveil alliance plan". BBC News. 17 December 2014. Retrieved 15 December 2015. ↑ Paine, David (2014-12-17). "Scramble for power as three bids emerge to shake up shires | News | Local Government Chronicle". Lgcplus.com. Retrieved 2015-09-07. ↑ "North Midlands Devolution Agreement" (PDF). Derbyshire County Council. Retrieved 2016-01-07. ↑ Marrs, Colin (11 September 2014). "London seeks combined authority powers". Room 151: Local Government Treasury, Technical and Strategic Finance. Retrieved 2 June 2015. ↑ "Bill stages — Cities and Local Government Devolution Act 2016". Parliament of the United Kingdom. Archived from the original on 5 March 2016. Retrieved 12 March 2016. ↑ "Cities and Local Government Devolution Act 2016". The Stationery Office. Retrieved 12 March 2016.